Kunden aus Umsatzsteuerbefreiten Ländern (US, CH) sehen hier netto Preise (67,23 EUR / USD 75.63*), nachdem eine Rechnungsadresse beim Checkout eingetragen wurde. Die Lieferzeit in die US betragen 7–10 Tage. 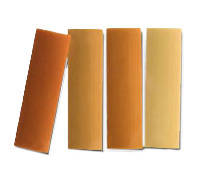 A set of four different hard rubber pads exclusively for Harry Hartmann’s Fiberreed that replace the supplied edition of medium hardness (not suitable for Fiberreed CARBON, Fiberreed NATURAL and Fiberreed NATURAL CLASSIC). Shades make ADDjust Vary Support easily distinguishable: the brighter the color, the softer the sound. The darker the color the more direct the response.